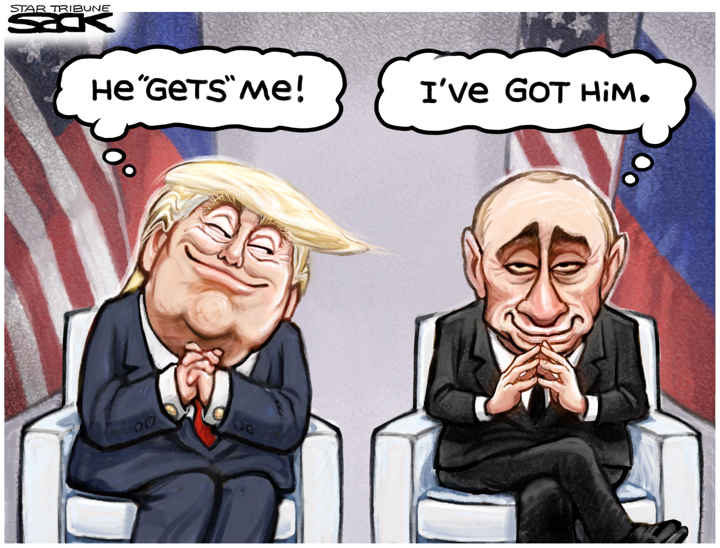 Yesterday President Trump of Russia, met Premier Putin of Russia in Helsinki, Finland, for what proved to be a bizarre and troubling conversation. If you think I made an error in describing Trump's title, it was intentional. He essentially lay on the floor, rolled over on his back so Putin could rub his tummy, then purred -- in Russian. 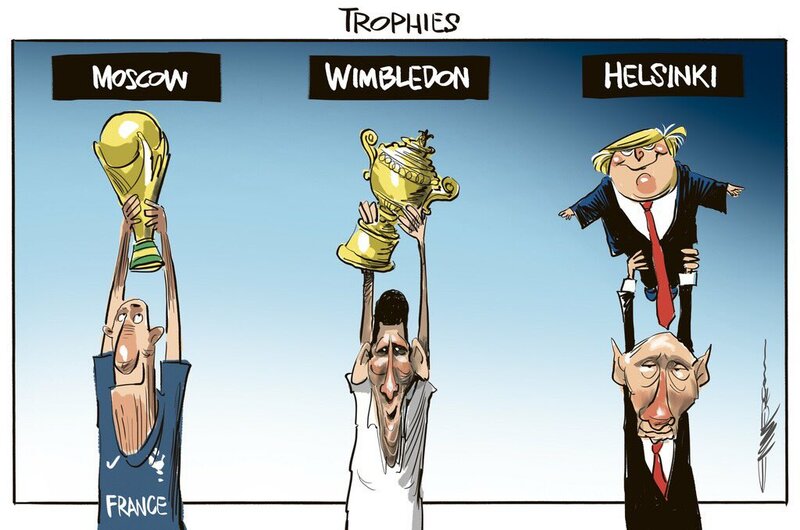 The Republican party fawns over Trump, as does the right-wing media, but there was a ton of push-back against his public criticism of US security agencies while giving Putin a free pass. To say his inept performance was traitorous is an understatement. They are, however, two like-minded men who perceive themselves as emperors, accountable to no one. Democracy is a sham in Russia and it is veering in that direction in the United States. Sadly, many leaders in the Russian Orthodox Church along with evangelical leaders in America act as though they owe allegiance to these self-appointed rulers, rather than to God. It is easy for modern-day readers to forget Scripture as we know it emerged from communities of religious minorities living under the heels of powerful nation-states. For the authors of Hebrew Scripture, it was the Egyptian, Assyrian, Babylonian, Greek and Persian empires. For the authors of the New Testament, it was, of course, the massive Roman Empire. The writers of the Bible likened these empires to great mutant beasts, with sharp fangs, powerful claws and multiple heads. Much of biblical literature is consumed with resisting them, both as exterior forces that opposed the ways of God and interior pulls that tempt good people with assimilation. Even those Christians who support the administration, or who say they want to stay out of politics, tend to inadvertently use the language of resistance as part of their religious parlance. In its biblical context, doing or saying something “in the name of Jesus” speaks in defiant contrast to edicts carried out “in the name of Caesar” or “in the name of the king” or “by the authority of the president.” Declaring “Jesus is Lord” implies by default that the present rulers are not as sovereign as they seem. Even calling Jesus the Son of God originally stood in specific contrast to the leaders of Rome, who demanded they be known by that very title. Jesus was not executed on a Roman cross for nothing, after all. To put one’s hope in Jesus, then, is to believe despite all the evidence to the contrary Jesus’ way of peace, justice, mercy and compassion will ultimately prevail over the empire’s ways of violence, exploitation, oppression and fear. Christians believe the resurrection of Jesus from the dead gives shape to these wild hopes. Even death at the hand of Rome could not keep him down. Yesterday was a sad and embarrassing day for the United States of America, which is not "great again" and never will be with Trump at the helm. I pray that Christians in the States will awaken to the resistance stories of scripture and be inspired toward change.